Thanks to Josh Reider for the great photo and stream report. This past weekend I was lucky enough to get up to the North Branch of the Susquehanna for a smallmouth trip. The day we fished we got on the water early, about 4:00AM. We had a blast fishing topwater flies and landed about five 4 pound smallmouth. As the sun got higher in the sky the topwater bite died off and were forced to start fishing streamers to the fish. Around lunch time we pulled up in a back eddy where there was a little bit of shade. About four bites into my turkey sandwich I saw what I thought was a beaver, but at a closer look I realized that it was a massive carp. I quickly changed flies to a small Vaverka’s Mantis Shrimp, then made about a 30′ cast to the fish. Once my fly hit the water, the fish turned and went the 6 feet directly to it, and ate it right away. Once I set the hook on the fish, it made about a 100 yard run out into the middle of the river. The current was relatively strong in the riffle I fought it in and made the fish feel twice as big. Quickly my uncle had to fire up the boat and chase after it so I wouldn’t break it off, and about 30-40 min after I hooked it we finally landed the fish on a 7 weight G.Loomis NRX. It weighted in at nearly 35 pounds. 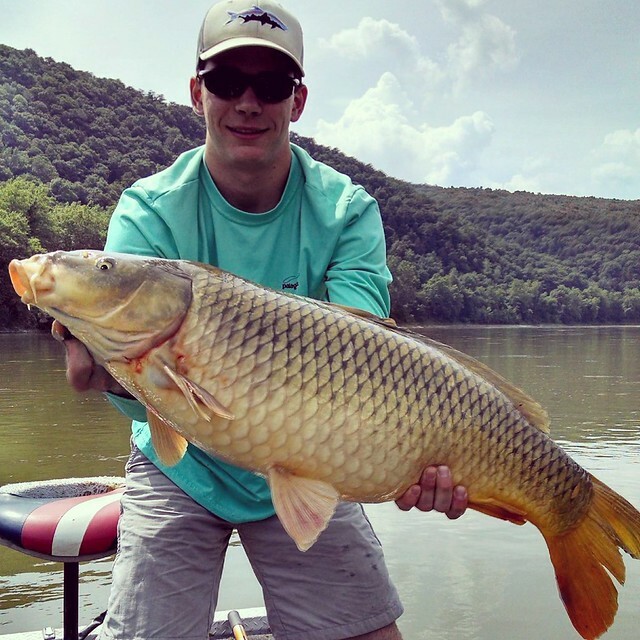 This entry was posted in fishing report on July 20, 2014 by Theaux Le Gardeur.